Category Archives: 15 “Twilight Zone”episodes with the most shocking twists! Twists… Twists… Twists. I love them! I live for them! I write them! I have created a whole television series just so I could invent them called “A Seat on a Train” at www.aseatonatrain.com There is nothing more exciting to me than someone coming up and saying, “See this movie, it has a great twist.” I want to know nothing more. I just want to see that film and get shocked with a crazy turn of events. Well, some of my favorite shows have twists and I learned from the best. First you have Alfred Hitchcock who always seems to fit a twist or two in his films and especially in his television series, “Alfred Hitchcock Presents.” But the master of the twist surely goes to my favorite writer and one of my favorite directors of all time, Rod Serling. This man is a master when it comes to creating amazing, shocking, believable twists. Now there are a lot of elements that have to take place to make a believable, shocking twist. The rules are pretty loose but if you don’t have a believable twist that isn’t predictable, then your audience is just going to laugh at your whole project. A bad twist can ruin a great film. I will give you a perfect example of this! This example is perfect to show you how a great film is destroyed by a bad twist. This horror film I loved until it got towards the end and the twist came. It was so bad that the director was booed at Cannes. I won’t spoil it for you because the twist is so bad, you really need to experience it yourself. The film is also a must see, because the first half is petrifying, edge of your seat horror. One of the best first halves of a horror film ever made. So, anyway, being such a huge “Twilight Zone” fan myself, I couldn’t resist talking about my favorite episodes with the best twists. I won’t give the twist away, but will give you a short description of each episode. So, let’s get to it! Happy Thanksgiving!!! Don’t forget to check out “The Twilight Zone” marathon!!! Happy Thanksgiving! 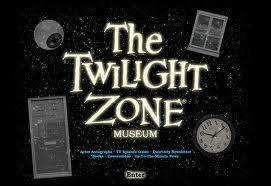 Don’t forget to check out “The Twilight Zone” marathon on the SYFY channel playing all day and night on Thanksgiving! You may catch a couple of my top “15 episodes with the most shocking twists,” if you’re lucky. I also figured I would give you a great movie recommendation to watch on Thanksgiving with your family. I watch it every year and love it. It is directed by one of my favorite Directors of all time, which I will do a top ten list for… really soon. I admire this Director so much because he did it his way. This film, just like many of his other films, was written, directed and produced by him! I love that! That’s what I want to do! And let me tell you this, the critiques were not too friendly towards his films like “The Breakfast Club” and “Sixteen Candles.” A lot of critiques panned his films which later would become the quintessential teenage films of the 80’s. His films are the perfect example of what life was like for kids in the 1980’s, down to the clothes they wore and how they chewed their gum. This Director felt the kids of the 80’s were overlooked and forgotten. He was right, the 80’s kids got the short end of the deal while the culture paid more attention to the cold war, corporations taking over and a President with his crazy trickle down theories. Thank god this Director took the time to make these films as we would have very few, legitimate, good films to watch that reminds us of our teenage years. This man was obsessed with the 80’s pop culture and loved the punk scene at that time. Not only did he make phenomenal films but he also hand picked the soundtracks himself and even got some really obscure 80’s bands to do original soundtracks for him. He loved music so much that he would later give out iPods loaded with his favorite music as Christmas and Birthday presents. If you guessed it, well done, well actually it’s the only really good Thanksgiving movie out there and I think it will stay that way. 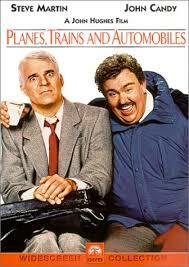 “Planes, Trains and Automobiles” made it’s debut in 1987 and was an instant hit. It instantly became a holiday favorite and is known as the only Thanksgiving movie worth watching out there. John Hughes was rumored to write the script in only 3 days. He also shot more than double the footage needed, so there is like 3 hours of this film on the cutting room floor. They should just release it as is, I would watch it. Actually, it’s probably better than half the crap that is out there today. Posted in 15 "Twilight Zone"episodes with the most shocking twists! The episode with the most shocking twist is… The After Hours (Season 1, Episode 34) On Netflix! Happy Thanksgiving! My gift to you is “The After Hours.” And what a great gift it is. This is “The Twilight Zone,” literally. It has the perfect Twilight Zone feel, the perfect TZ sound and definitely the perfect TZ story! Not only is it shocking but the main twist reveals itself in the middle of the episode, out of nowhere, then it ends with a pretty cool one too. That is why this episode got its spot at the top of my list. “The After Hours” is so well written, has very interesting characters and grabs your attention right from opening.This episode plays with you, with interesting camera shots, spooky music and whispering voices. I saw this episode when I was young and it scared the daylights out of me. I never will view Department stores the same again. I still find the subject matter very creepy today. The description– Marsh White browses a department store looking for a gold thimble for her mother. She is directed to an empty elevator with just the elevator man inside. She finds the man and the fact she got an elevator all to herself on such a busy shopping day, very strange. The man takes her up to the ninth floor. When Marsh steps out, she realizes the floor is empty and turns around to get back on the elevator, but the doors close on her. She wanders around the floor confused. There isn’t a thing for sale and no sales associates. Marsha is all of the sudden startled by a mysterious saleswoman, wearing a dress suit, stepping out of the shadows. The sales woman takes her over and shows her a gold thimble that is for sale. Marsha is extremely puzzled by this. She can’t believe a whole floor has nothing but the one item that she came to purchase. And that’s it! Did I get your attention yet? I can’t go any further because I will end up revealing the twist. And what a great twist it is! A shocker that will send shivers up and down your body. The way they reveal the twist accompanied by squealing violins, is just plain jarring and makes you take a second look at a certain object that is displayed in most department stores. I find them plain creepy. So, that’s it for “15 Twilight Zone episodes with the most shocking twists.” There are plenty of other episodes to explore, but if you love the twisted ones, then you have come to the right place. Let me know your thoughts on the list. Maybe I forgot an episode that you think should have been on the list. Don’t be shy, let me know. Episode #2 is… A Stop at Willoughby (Season 1, Episode 30) On Netflix! You ever had that job you just couldn’t stand? A job where you make a good living, but grit your teeth every time you have to go in? A job where your heart starts to race as you enter in the morning, revealing signs of a panic attack? A job, where you know you have to go in and are counting down the minutes to the inevitable? A job so bad, you find yourself making up another place that is magical and is the place you would rather be? I think we have all been there before. If you haven’t then you are either really young or you are extremely lucky. Hold on to it as long as you can, because you don’t want to be apart of this “Twilight Zone” episode. You want to know my favorite episode of all time..? well here it is. I absolutely adore this episode from beginning to end. “A Stop at Willoughby” has everything. A great story everyone can relate to, a mysterious plot that keeps you thinking and of course, a shocking, memorable twist! Actually, this one has two twists where one sets up the other and are both equally jarring. 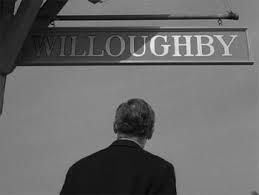 “A Stop at Willoughby” is nothing short of a masterpiece and is the best written episode out there. If you only see one episode from this great series, this is the one I recommend. The twist will shock the crap out of you and you will smile in satisfaction when it’s over. The description- Grant Williams works at an advertising agency in Manhattan, New York. He is completely fed up with his career. After taking a hammering from his boss for losing an account, Grant nods off on the train, on his way home. He later wakes up and the train has stopped. A Conductor yells “Willoughby… Last Stop Willoughby…” Grant notices that he has woken up in the 1800’s, in a nice quaint town called Willoughby. A town where a man can walk slow and smell the flowers. A town where Huckleberry Fin would be raised. Grant goes to look out and the train starts moving again. He wakes up back in his own time, still on the train. When home,Grant explains this dream to his wife. He says he wants to live in that town, a town he has manufactured in his head. She gets angry with him. She pretty much tells him that she wants to be with an executive, not a guy who thinks he’s Huckleberry Fin. His success is basically all she married. I will leave it right there. That is the perfect spot for me to leave it. The ending will blow your freaking mind. It’s so good and now I think of it, it kind of has a creepy message. It leaves you a little horrified but happy at the same time. The acting is phenomenal. The sets and camera work are amazing. And you can’t forget about the dialogue. Especially the boss screaming “Push! Push! Push! If this episode was a movie, it would have an oscar. Yeah, it’s that good! Speaking of trains, why don’t you come and take “A Seat on a Train.” It’s a series I wrote and directed. I released the 1st episode on Halloween called “Out of Place.” I pay homage to Rod Serling’s creepy classics with up to date stories that pertain to our times. Episode #3 is… To Serve Man (Season 3, Episode 24) On YouTube! 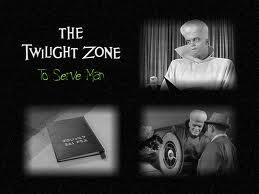 The twist in “To Serve Man” is nothing short from phenomenal! It is one of the most shocking, jarring twists out there and it definitely doesn’t leave you with a nice, warm fuzzy feeling like “Night of the Meek.” This episode fully deserves this ranking on my list and I found it hard to put it this low. The story is extremely interesting and has a great message as well. Rod Serling’s underlying problem with man and war comes out in this episode once again. But this time he tackles the issue by showing a world that has no more war, no more hunger and unlimited resources. What if an advanced being came to earth and promised to solve all our problems with nothing asked in return? A great subject to tackle, but as we realize with our own selfish needs, that nothing ever comes without a price. The description– We open up with Michael Chambers on a space ship. A voice instructs him to eat. He refuses. He asks what time it is on Earth and then starts to tell a story, luring the audience into a flash back. What has happened is the Kanamits, a nine foot alien race, has landed on Earth. These aliens are much more advanced than humans, they even communicate by using telepathy. They inform the humans that they have come in peace, but world leaders are very skeptical of these strange beings, until the aliens start solving all of man’s problems. The Kanamits have the technology to grow anything anywhere, destroy all nuclear arms safely and supply the earth with cheap unlimited resources. Solving all of men’s problems, the humans naturally start to trust the aliens. Then the trust is even more justified, when Patty, one of the cryptographers, translates the title of a book they had given as a peace accord. The title turns out to be translated as “To Serve Man.” Well, with war, poverty and the lack of resources not a problem anymore, people start to get curious to what the alien’s planet is like. So the Kanamtis start arranging trips back to their planet. I will say no more, I have probably said too much. When they drop the bomb on you, you are not going to believe it. You will never figure out what the twist is. It is ingenious. The only reason “To Serve Man” scored lower than the next two postings, is because I felt the beginning and ending could have been a little tighter and more well though out. But other than that, get ready for a shocker! This one is a doozie! Want to see another great twist that I wrote and produced? Come and take “A Seat on a Train” at http://www.aseatonatrain.com I promise you my twist will not disappoint. Episode #4 is… The Eye of the Beholder (Season 2, Episode 6) On Netflix! So get ready folks for a real shocker. This one grabs you out of nowhere and the conclusion just sends chills up and down your spine, a few times. I saw this episode when I was young and it scared the crap out of me. I seriously had nightmares about this twist throughout my childhood. 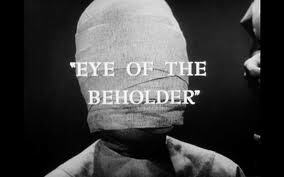 When I talk about scary, unsettling episodes, “The Eye of the Beholder” is at the top of my list. I actually couldn’t watch it again until older because it freaked me out so much. Not only does “The Eye of the Beholder” have an unbelievable twist, but the twist is followed with a few really meaningful, loaded messages. These messages are so great that it will keep you thinking for weeks. The description- Janet Tyler has undergone her 11th surgery, the maximum that is allowed for a patient. We see her lying in a hospital bed, her face all bandaged up. She pleads with a Doctor to remove the bandages now. She can’t wait to see if they were able to get rid of her horrible deformity. She has lived most of her life under bandages and wants to be free of this dark cave. The Doctor refuses to remove the bandages and tells her she must be patient. We learn that Janet Tyler’s eagerness is caused by her own certain demise if the surgery is not successful. If not successful, Janet will be sent to a camp with her own deformed kind, to live out the rest of her life. I will say no more, I may have said too much! This episode will blow your mind! Get ready for a very shocking twist and images that will make your goosebumps get goosebumps! This is another example of Rod Serling’s mistrust of people and especially Governments. This episode really runs true, even in America today and is rampant in a lot of other countries around the world. We still judge people by the color of their skin and the way they look, to this day. A certain thing that has gotten better in some countries, over time, but still exists everywhere you go. So, get ready, turn of the lights and enjoy. You are in for a treat here. I will say it again, “Eye of the Beholder” is definitely in the top 5 of the best episodes of all time, in my opinion. Rod Serling wrote a gem here and has also admitted that “The Eye of the Beholder” is one of his favorite episodes. Yeah, it’s that good! Episode #5 is… Time Enough at Last (Season 1, Episode 8) On Netflix! This is not only a fantastic “Twilight Zone” episode, it is a piece of short film art! You talk to anyone who is familiar with “The Twilight Zone” series, there’s a good chance they will bring up this episode. It’s not just because Burgess Meredith is absolutely perfectly cast and is awesome, as he is in everything else he ever did. It’s not just because the story is so powerful, even though it is one of the most well written and acted episodes out there. The reason people talk about this episode is because of the twist. “Time Enough at Last” doesn’t have the creepiest twist out there, but it is a shocker! I mean a real shocker! You can’t believe what happens to this character and you will want to watch it again. It doesn’t surprise me that this was one of Rod Serling’s first episodes, because it is one of his best. “Time Enough at last” is fresh, interesting and packs such a punch at the end. I have watched it over and over, time and time again and still I don’t get tired of the twist. I am thinking about it right now while smirking. You are really in for a treat with this one. 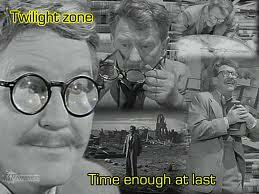 This is one of the best examples of Serling’s genius and is the quintessential “Twilight Zone” episode. The description- “Time Enough at Last” is about a bank teller named, Henry Bemis, who loves to read and will open a book anytime he gets a chance. The problem is that it affects his work and home life. He is always making mistakes at his job and has no form of communication with his wife at home. This is for a good reason because his wife and boss are impossible, demanding people. Henry is more of a book worm, who keeps to himself and hates confrontation. One day Bemis is on his lunch break and is looking for a nice, quiet place to read. Well, he finds the bank vault to be a good fit and makes his nest there. He slowly doses off while reading when all of a sudden, he is woken up by a loud boom and the whole vault shaking around him. I will say no more, I said too much! If you haven’t seen “Time Enough at last” then get excited, really excited, because this episode will not disappoint! It’s that good that it will live up to any grand expectations I set and probably exceed them. I think there is a Bemis in all of us and when you see his demise, it just hits that more close to home. Episode #6 is… I Shot an Arrow into the Air (Season 1, Episode 15) On Netflix! I know what you’re thinking, what a horrible poster… but is it? Well, you’re looking at the twist, right there! 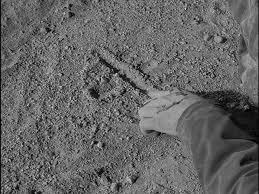 The whole episode comes down to that primitive marking in the ground and when you find out what it is… man, this episode really shocks you. It has a really cool twist that you keep on thinking about after. I actually went ahead and watched it twice and it was even better the second time around! This is Rod Serling at his best and it doesn’t shock me when I found out it was one of his first. Not only does it have a great twist, but the life lesson is really good also. It shows you how some men truly are when their lives are in danger. You have the people who work as a team and then you have the ones who are out for themselves. When rations are low and one less man means more days to live for the others, some men find there lives more important than the ones around him . Well, that’s the theme of this episode. 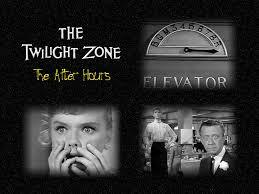 A theme Rod Serling loved to write about, how people are truly like when a crisis happens. He also tackled the same theme with an episode called “The Monsters are Due on Maple Street.” This one is worth the watch. The lesson is really good but the twist is really cheesy. That’s why it never makes my lists. “I Shot an Arrow into the Air” really shows Rod Serling’s problem with man himself. I think a lot of these great episodes were a way for Serling to show his displeasure with the war he fought in. In WWII, Serling saw a lot of horrors being apart of “The Death Squad,” which fought in Japan and had a 50% casualty rate. These episodes really show what he felt man is capable of and even more, showed his absolute mistrust of his fellow man. Even the people who are supposedly close to you. The description- An eight man aircraft crashes on an asteroid. Four men are dead and another critically wounded. Cory wants to take his water and save it for them later. He feels the man is doomed anyway, so why waste water on him. The other two men, Donlin and Pierson, are appalled by Cory’s behavior and refuse to let a dying man suffer from thirst. Well, the man ends up dying and the three guys decide to go trek and see if they can find water. Well, Donlin doesn’t return and Corey has a full cantine after coming back from a long hike. Pierson decides to hold Corey at gun point and make him lead him to Donlin. So they find Donlin barely alive. Donlin points toward the mountains. Then, he weakly draws a large T in the sand with his finger and dies. That’s it! I will say no more! Wow, is this a great episode. I am so excited for the ones who are seeing it for the first time. This one really blew my mind and is one I talk about to everyone. The only reason it scored lower is because of how they reveal the twist. They draw it out a little to long with an unnecessary voiceover narration. Not a great choice, but everything else is pretty much perfect. Hey, after you enter “The Twilight Zone” come take “A Seat on a Train” at http://www.aseatonatrain.com. Come and watch the first episode which released on Halloween! I promise you, it will not disappoint.